The term Black Belt has earned a reputation in our culture as something to be held in high regard, even revered. An instructor of mine once told me he thought being a black belt was a higher achievement than being a doctor or a lawyer. But becoming a black belt is not a final destination. In fact, in the eyes of a grandmaster, a shodan ( first degree black belt), is little more than a serious beginner. For centuries, martial arts were taught under a grading system called menkyo. If a student trained digilently for many years, he would be given a teaching license called a kaiden. But among the students themselves, there was no rank and file. Then in the late nineteenth century, the colored belt ranking system was introduced into the art of Judo by its founder, Jigaro Kano. 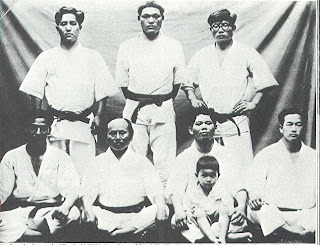 Ranks below black belt were referred to as kyu. Black belt ranks would be called, dan. And so, the kyu/dan grading system was developed by Master Kano to encourage his students to set goals, improve their skills, and build confidence towards the day they could earn the coveted Black Belt.